Blog Students Success at Listowel! My brilliant writing students have done it again at Listowel Writers’ Week Literary competitions for youth! 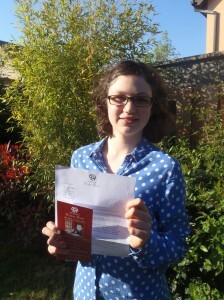 Sadbh Cushen (who attends classes in Skerries) has won first in the category for under nines. Sadbh wrote a beautiful piece about what it’s like to live with Sensory Processing Disorder. 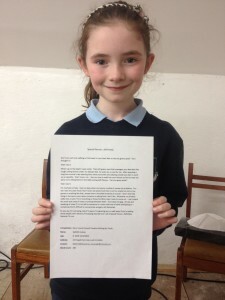 Grace Lenny (an online student) has won first place in the twelve years and under category with a compelling tale about the Easter Rising. And Sarah McKenna, who attends my teenage class in Loughsinny, has achieved third place in the fourteen years and under category with a moving story about a man saying goodbye to his dead wife. I’m so delighted that these writers are being recognised for their talent. They are invited to attend an awards ceremony at Listowel Writers’ festival in June, and will have their stories published in an anthology. Well done!! 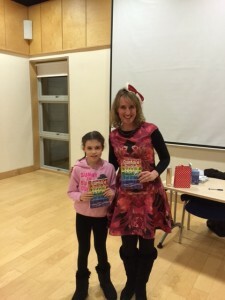 Megan Wynne with Grace Lenny ,Listowel Literary Competition for under twelves winner.